Has been "lost and co" for a good few years now. A warm friendly (relatively) independent bar that has a good selection of beers on tap, changing regularly and kept well. Also has an excellent collection of bottled beers and spirits that you're general bland putneyite hasn't got a clue about, so, if you appreciate their selection, they're often even nicer to you... The quality does come at a premium price (pint is fiver) and I wouldn't come here on a weekend evening where its heaving, noisy and sweaty full of suits and heels- great if that's your thing. However I do like to treat myself to a quiet drink on here every now and then in the week. They are one of the few bars in London that sell el dorado 15 yr old rum ( at £8 a shot ) . Can't believe have only recently discovered BRB. Funky cocktails, great music and a hot barman....who could ask for more? 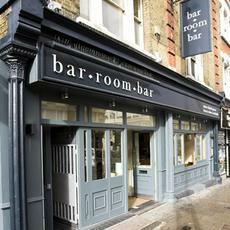 As mentioned, this is a trendy bar on the high street and I think that it pulls it off quite well. 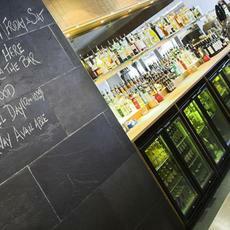 It has a stone baked pizza facility, as does the Bar Room Bar in Hampstead so I�d imagine this is part of a chain. The manager was friendly enough and along with Carlsberg there is plenty of premium lager to choose from. It is a little dark, but the funky music was at a good level and I also spotted a plasma screen. This is not really my scene but I can see the attraction, especially with the 2 for 1 cocktails from 5 until 7 every evening. This place has a good selection of reasonably priced cocktails. Its open very late and is free to get in which is something of a rarity. Can attract some dodgy clientelle though due to the late license, but the bar staff are speedy and friendly considering how many cocktails they have to churn out. Not really a good place to come and watch sport, but its great to nip in at some godawful hour for a nightcap.